Inject about one ounce of the brine per pound of weight of the turkey. For a 12 pound bird, inject 2 ounces into each leg, thigh, and breast half. Insert the needle fully, then begin to slowly inject the brine as the needle is being pulled out. Add brine to different areas by pulling the needle out partially, then pushing it back in to a different spot, injecting as you pull it back out again. It's best to let the turkey set in the fridge for 2 full days before smoking it. This will give time for the flavors and salt to distribute throughout the meat, and for the Tender Quick to do its thing. Tender Quick is a product of the Morton Salt Company. Along with salt and sugar, it includes sodium nitrite and sodium nitrate, which are curing salts that inhibit bacterial growth and enhance the flavor and texture of meats. If you have concerns about eating foods containing nitrates and nitrites, the Tender Quick can be left out of this recipe. Using the gas grill smoking method, cook at 325 degrees for 10 minutes per pound, using apple wood for smoke. Then wrap with foil and continue smoking until the thigh reaches 175. Remove the turkey from the grill and let it rest for an hour. During this time the internal temperature will rise a bit and the juices will redistribute themselves evenly throughout the meat. 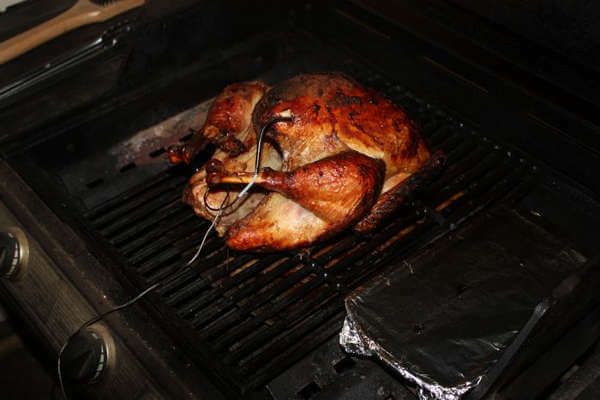 Your grill smoked turkey can now be unwrapped, sliced and served to your anxiously waiting guests. As an Amazon Associate, Smoker Cooking earns from qualifying purchases.